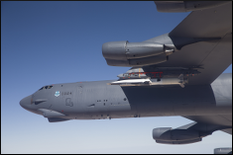 On May 1, 2013, the final flight of the X-51A Waverider test program achieved a breakthrough by reaching a sustained, hypersonic flight using air-breathing, high-speed scramjet propulsion. The fourth and final test vehicle launched during the program reached a speed of Mach 5.1, traveling more than 230 nautical miles in just over six minutes. University of Maryland Department of Aerospace Engineering Professor Mark J. Lewis and alumni Charles Brink and Kevin G. Bowcutt have been principal contributors in the X-51A’s ten-year program. Lewis, who is also the Director for the Institute for Defense Analysis’ (IDA) Science and Policy Institute, has been a key leader on the program, serving as the Chief Scientist of the U.S. Air Force (USAF) for the X-51A program from 2004 until 2008. During that time, Lewis expanded research support and focused efforts on high-speed flight, sustainment, launch vehicle technologies and operational space. His four-year tenure with USAF makes him the longest-serving Chief Scientist in USAF history. Brink and Bowcutt, both Department of Aerospace Engineering Academy of Distinguished Alumni inductees, have been involved with the X-51A project since its start. Brink serves as the X-51A’s program manager for the Air Force Research Laboratory Aerospace Systems Directorate. He’s been leading the $300M effort through Preliminary and Critical Design Reviews and has coordinated the efforts of the Boeing/Pratt Whitney Rocketdyne X-51 Consortium with the Air Force Flight Test Center, Naval Air Warfare Center, and NASA for all test flights. In the May 3, 2013 issue of Air Force Print News Today, Brink stated the project “was a full mission success" and that the “X-51A Waverider will serve as a bedrock for future hypersonic research and ultimately the practical application of hypersonic flight." Bowcutt, a Boeing Senior Technical Fellow and Chief Scientist of Hypersonics for the Boeing Company, has served as a primary designer for the X-51A program. He is a recognized expert in hypersonic aerodynamics, propulsion integration, and vehicle design and optimization. Due to challenges of heat and pressure at Mach 5, conventional turbine engines are impractical at hypersonic speeds. The X-51A uses a supersonic combustion ramjet, or Scramjet, engine that is unique in its use of hydrocarbon fuel. Using no moving parts, the Waverider injects hydrocarbon fuel into the combustion chamber where it mixes with oxygen pulled from the atmosphere to create combustion, not unlike trying to light a match in a hurricane. The X-51A was dubbed Waverider because it was designed to ride its own shockwave. The X-51A program started in 2004 as a collaborative effort of the Air Force Research Laboratory and the Defense Advanced Research Projects Agency (DARPA) with industry partners The Boeing Company and Pratt & Whitney Rocketdyne. The program set out to prove the viability of air-breathing, high-speed scramjet propulsion for hypersonic flight and provides foundation knowledge that could be used for advancing technologies for future access to space and long-range weapons. While the program does not currently have a successor, in a statement made on May 3, 2013 in an American Institute of Aeronautics and Astronautics (AIAA) press release, Lewis said, “The X-51 program has advanced our knowledge and understanding of nearly every aspect of high-Mach vehicles, from fundamental understanding of materials, aerodynamics, and combustion, to the practical aspects of vehicle design, and has been a marvel of interagency-industry cooperation. Hopefully our nation will have the wisdom to build on this aviation milestone and continue the quest for operational hypersonic flight." For more information on Mark Lewis’ research. For more information on Charles Brink and Kevin Bowcutt, visit Department of Engineering's Academy of Distinguished Alumni page. For more information on the X-51 Waverider, visit the U.S. Air Force’s X-51A factsheet. See video of the final X-51A Waverider test flight on Wright-Patterson Air Force Base's website.